PLATE 1. Talking Rocks Cavern opens into an underground fairyland. 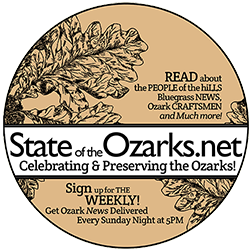 The history of the ages often collides with our old-time pioneer and hillbilly memories here in the Ozarks. Such was a day back in 1883 when two boys went rabbit hunting in the steep and rocky hills west of Notch, Missouri, and north of the Kimberling Ferry. Their quarry eluded the boys by leaping beneath a large hillside rock. The boys removed the stone to find a dark rift reaching deep into an older earth long forgotten — the vertical entrance to what would become known as Fairy Cave. Thirteen short years passed. By 1896, the Irwin Family had homesteaded this parcel of Ozark rock and glade and the youngest of the family’s three sons, Arthur Irwin, asked neighbor Truman Powell to lead an exploration into the cave. 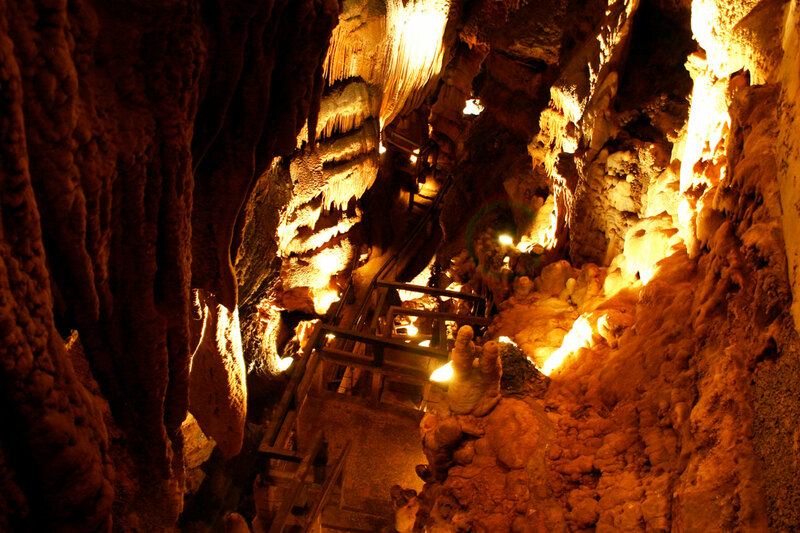 Powell, having served as vice president of the Marble Cave Mining Company (the business responsible for mining the guano from the immense Marble Cave near Notch), was regarded as an expert on caving. A teepee-style winch was built and four strong men began lowering that first exploration party into the inky darkness. PLATE 2. Mysterious and exquisitely ornate, the vertical depths of Talking Rocks Cavern beckon. Suddenly, Truman called for the men to stop lowering. He hung there in awe, suspended before a towering column that, in the light and shadow, appeared as a giant angel, head bowed, wings outstretched (PLATE 7). It was the first of several massive yet intricate formations to be discovered that day in 1896. 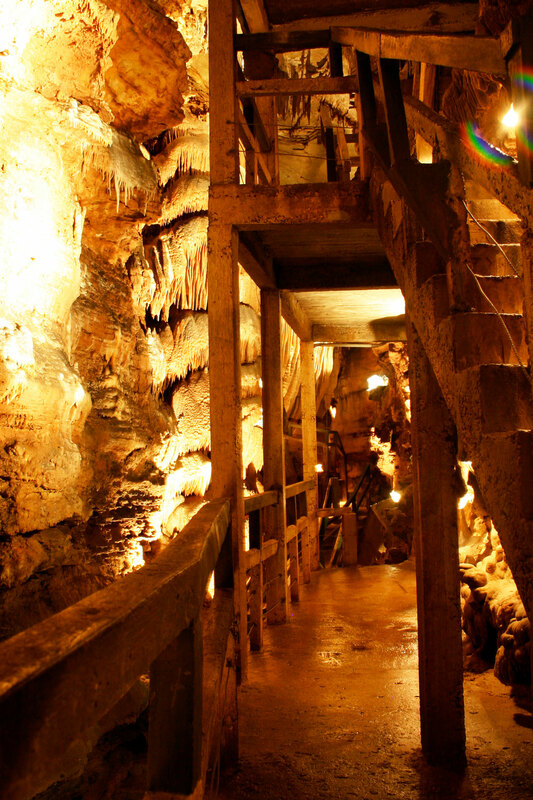 Truman’s youngest son, Waldo, would purchase the property in 1907, opening the cavern as a tourist attraction in 1921. An old-time front porch was built where visitors could sit a spell and enjoy the breeze rising out of the holler. The words “Fairy” and “Cave” were painted in white, circled in black, above, while an inauspicious window and front door gave no indication to the adventure waiting those old-time visitors (PLATE 3). The front door opened, not to an unassuming pine-floored room, but instead a vertical and seemingly bottomless cavern (PLATE 2). Oaken steps led onto platforms overlooking massive drops and a cavernous hall appearing to stretch for miles into the darkness (PLATE 1). Weird shapes leered at every turn. Black and white slimy salamanders scuttled underfoot (PLATE 4). And far below, water would gush during the rainy times, filling a small lake brimming with underground life. PLATE 3. 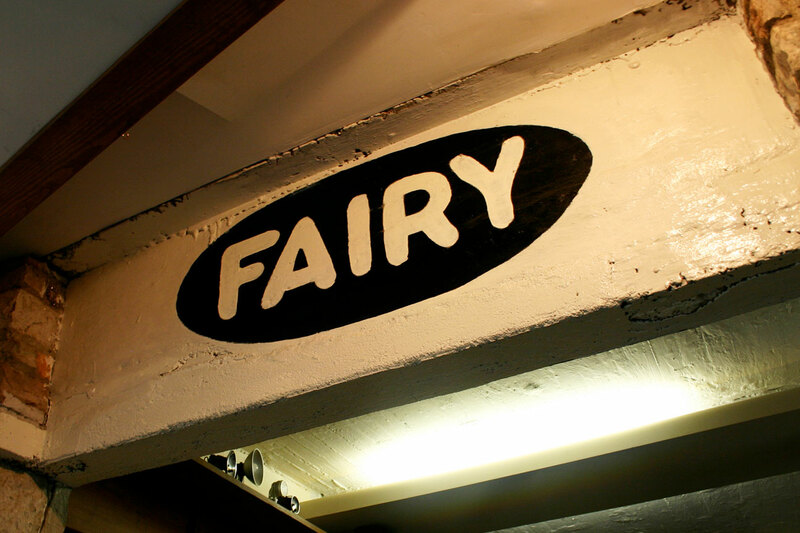 First regarded as a “subterranean fairyland,” Talking Rocks Cavern’s original front porch is still adorned with 1920s era signage. PLATE 3. 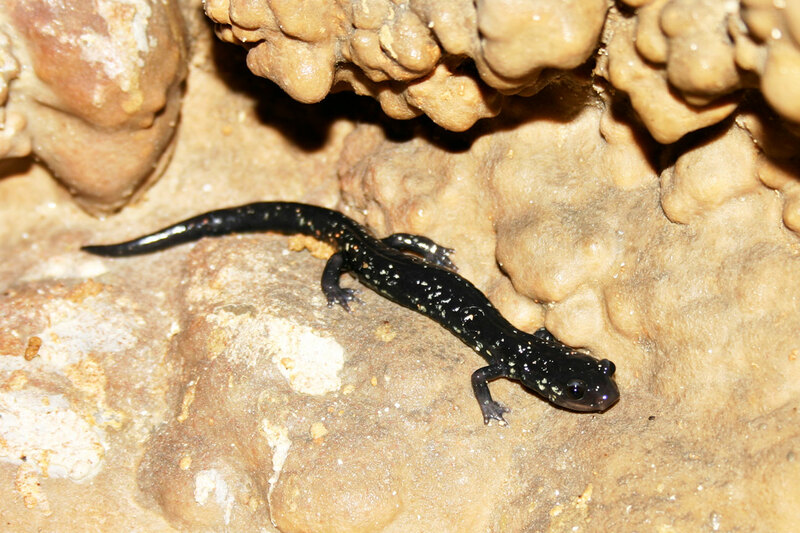 A northern slimy salamander (Plethodon glutinosus) finds its home in Talking Rocks Cavern. The species is one of several found in Missouri caves. In time, the wooden walkways and steps would rot away, replaced by a series of concrete steps and platforms between 1927 and 1929. Much of this scaffolding remains, a testament to Ozark ingenuity and a reminder of our region’s long years of tourism (PLATE 6). 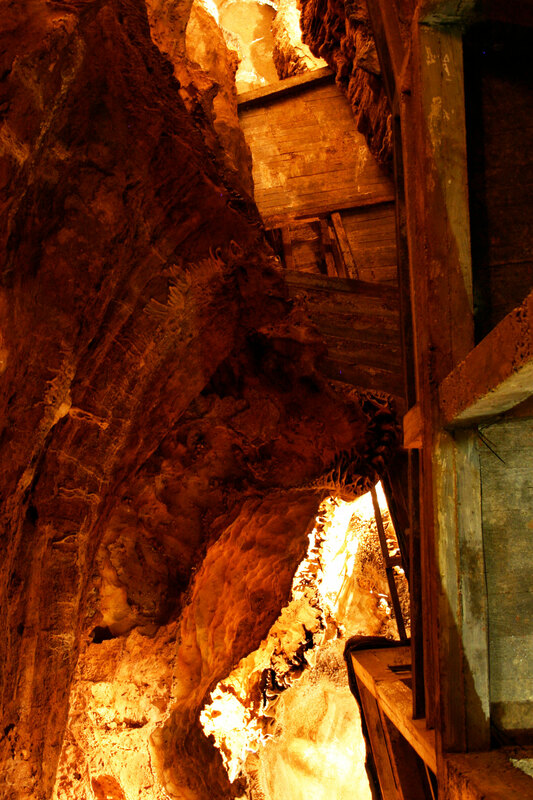 All building materials were lowered by bucket to the cave’s floor over 100 feet below. Forms were hammered together, cement mixed bucket by bucket using the perpetual water of the cave pools. PLATE 5. Looking up, the wallkways trace through cloud-like formations of rock. Far above is the ceiling of Talking Rocks. Deeper within the winding recesses of the cavern’s grand hall, the new concrete walkways reached a towering, 90-foot-high formation simply known as the Cathedral. Eons past, a vast mound of red mud had been deposited within the cave. Limestone formations slowly reached over the mud, like candle wax dripping over an egg. In a later age, water began to pour swiftly through the cave, dissolving the mud and leaving a massive, hollow formation. Still yet today visitors are led through the Cathedral, marveling at the intricate traceries of rock. As it should, Talking Rocks remains much as it has these past ages. Water drips down the walls, slowly building more exquisite draperies. Salamanders scuttle beneath and cave crickets dart about. There is an echoing timelessness here. A reminder of ages long past, discovered with each new generation, each with stories of their own. It is a place where our memories and the history of the ages again meet. ALL PHOTOGRAPHY BY JOSHUA HESTON, ALL PLATES,OCTOBER 27, 2010.